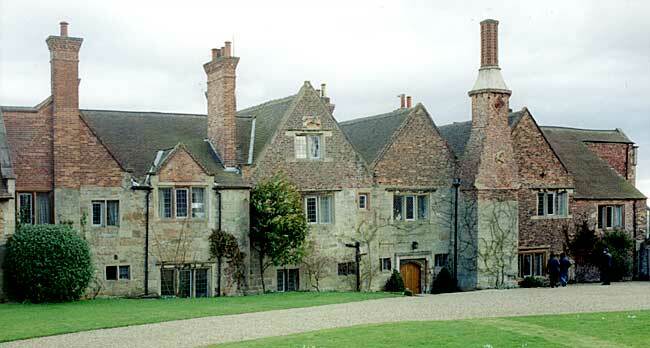 The west front of Felley Priory (photo: A Nicholson, 2004). THE little hamlet of Felley has been so overshadowed by its priory that its secular annals are scarcely to be discerned. Local topographers have said little of it and its records are certainly fitful and few; it is only at rare intervals that they appear; yet there is reason to believe that it existed as a place of habitation long ere the monastery was called into existence and subsequent to the suppression of the priory it has had historic moments of its own. and it has daringly been suggested that Shipton Hill, spelt "Chepynghyll" 400 years ago, may be identical with the Saxon "cieping," a market or fair, though the prosaic Old English "scipen," a cowshed, is more likely to be correct. Equally mystifying is the mention of a church here in the reign of Stephen: no other record of it is known but presumptive evidence indicates the existence of Felley in pre-Conquest times. It is not mentioned in Domesday, being perhaps included with Annesley as of too small value to be separately noticed. In 1156 Ralph Brito of Annesley gave "the place of Felley" to Robert the hermit but the site of the hermitage and the date of its origin are alike unknown though it may have been carved out of the hillside, after the fashion of the still preserved hermitage at Dale Abbey not far away. Presently he recalled the gift, the foundation of monasteries was a fashion of the time entailing present fame and the promise of future rich rewards and Ralph and his son accordingly established a small priory of Augustinian black canons, bestowing upon it "the church and hermitage of Felley" with, his church at Annesley and rents for the maintenance in the priory church. The date of the grant is given as 1156, yet Worksop Priory claimed that Ralph had presented Felley church to it in 1151 and the Pope upheld their claim with the result that for a century the priory here was a "cell" subordinate to Worksop and paying a pension to it of 10s. a year. In this reduced status Felley Priory remained until 1260 when a long course of litigation was closed with the renunciation by Worksop Priory of all its rights and claims in Felley in return for an increase of its pension to 20s. No history of the priory can be comprised within the limits of this short sketch of the village. Most of its records relate to internal matters or to its possessions elsewhere, but throughout the mediaeval era it was the dominating factor in the vicinity. The priory servants cultivated its fields; its swine fed on the acorns and mast of the adjacent forest; in the reign of John the freebooters of the oppressive Reginald Marc may have sallied out from his Annesley stronghold on marauding expeditions and the myrmidons of the Greys of Codnor would often be seen under more peaceful aspects. In slackly governed and impecunious small monastries enclosing walls, ditches or fences were apt to fall, into decay and the repeated injunctions of about 1270 for "a house of canons in Notts." to put its restraining boundaries in order probably had reference to Felley. It was small and poor and in 1276 its prior was deposed for mismanagement and misbehaviour. He had permitted the priory buildings to fall into disrepair and the canons had erred and strayed to the scandal of the neighbourhood. The priory had a grange at Selston and there would be constant traffic between it and the tithe-barn here with calls for labour from the monastic tenants. In 1349 the prior died of the Black Death and he may not have been its only victim in the locality. 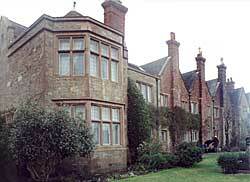 The east front of Felley Priory (photo: A Nicholson, 2004). Upon the suppression of the priory in 1539 it was granted with its lands at Felley, including "certain acres here reserved to the use of the household of the late prior, a messuage, a granary, a water-mill called Felley Mylle" with other properties to William Bolles. His grant specifies that a close called Ollerschay, another called Corne Bradley and one known as Lamberstorth were among the old priory lands then purchased. They must soon have returned to the Crown as Queen Mary sold them in 1551 to Sir Anthony Strelley who forthwith attempted to sell them to the Earl of Rutland as an excellent investment, and when the earl declined the offer Sir Anthony sold his ''woods at Ollershaw on the east side or the water called Holwell Springs'' to the miller of Felley Mill for £30. It is intriguing to think that this holy well may have been associated with the hermitage. Once more the Felley property of the old priory reverted to the Crown, James I finding a customer for it in the person of Anthony Millington to whom and his heirs they were granted for a rental of £17 3s. The Millingtons made it their family seat and here Gilbert, the son and heir of Anthony—the future regicide—was in 1628 receiving tidings of the growing rift between the king and parliament. A member of the Long Parliament and Deputy Lieutenant of the county in 1642 when the war broke out, he was marked out for punishment by the Royalists; his home at Felley was seized and sacked by them to the certified extent of £1,713, the house was garrisoned for Charles and in 1644 Colonel Hutchinson reported a melee here. Some troops returning with booty from Newstead Abbey, were, he said, surprised by a Cavalier force "while foraying about Felley: Nottingham troops were hurried up and saved the day." Millington was one of those who signed the king's death warrant, for which at the Restoration he was condemned to death, but making abject admissions and pleas he was spared the gallows and spent the rest of his life it captivity at Jersey where in 1676 he died. When Thoroton wrote in 1677 he said "the priory and property remain, I believe, to Edward Millington, son of Gilbert the regicide, or to his grandson, Edward." His conjecture was correct, for out of the wastage of the regicide's possessions this estate was saved as is shown by an inscription in Greasley Church to the memory of another Gilbert Millington "of Felly Abby Esq," whose only son died without issue. By the marriage of his daughter the property passed to the Rev. Thomas Holden of the Nuthall family who appears to have neglected the house. In the course of the 18th century some surviving portions of the priory structure were preserved during reconstruction of the mansion which passed with the other Holden property here to the Hodgkinsons who after improving the building and residing in it sold it to John Musters who had acquired Annesley by his marriage to Mary Chaworth, and with his descendants it yet remains. A hundred years ago it was stated that "nothing now remains of the ancient Priory building except what is incorporated in a large house partly occupied by a farmer whose garden occupies the site of the chapel." The township was then extra-parochial and the forty odd people who formed its population worshipped in the chantry chapel, known as the Felley aisle, in the now deserted old church at Annesley. In 1869 the remaining wastes and open lands were enclosed, and about sixty years ago Mr Hubbersty, J.P., made a partial restoration of the house and occupied it, some of the walling and pillars of the monastic church and a handsome chimney of moulded brickwork, said to date from the 16th century, being preserved in the garden wall. It is now called the Priory Farm. Thus the priory which commenced as a hermitage has become a farmstead. In Lawrence's "White Peacock" it figures as "Greymede Abbey," and in the same fine story Felley Mill appears under its proper name.